Spacious apartment ***, all comfort, furnished with terrace of 12 m2 enjoying a splendid view *** on the old chin and the sea. Very charming. Ideal to enjoy the gardens of Menton, the hinterland and Italy. Quiet, 10 minutes walk from the shops and restaurants. 10 minutes walk from the sea. The apartment is rented with a secure parking space in the basement accessible by lift directly. A very comfortable, light and airy apartment - so easy to feel at home! Situated in a very convenient location, with a wonderfully inspirational view, it was was very hard to leave. Thank you Laurence and Patrice for such a great stay. Thank you for your positive review. We look forward to welcoming you again next year !!! Our second time this year to menton, first time in this apartment. Well equipped and well presented situated in a quiet clean block. Easy train for a visit to Monaco and Nice. Went inland to explore some of the nearby villages on the good local bus service. Was easy to get out and explore the area without a car . 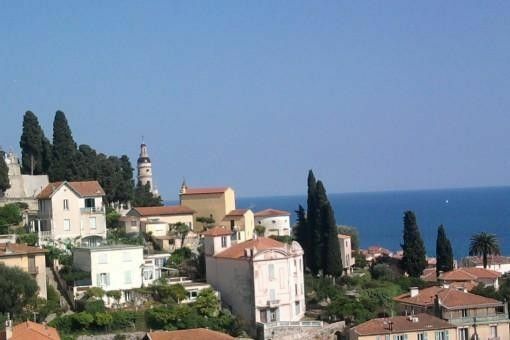 Menton is a lovely town with a great choice of restaurants serving lovely regional dishes. Overall, we love visiting Menton and the apartment was a great place to stay, the owner, Laurence was very helpful and quick to reply to any query we had. Overall, lovely apartment, lovely town. Thank you for your positive comments, it's always gratifying to hear that our guests have enyoyed their stay. We really enjoyed our stay and hope to return. We miss the view from the terrace now we are home. The apartment is an unbelievable bargain. It is impeccably clean, stylish, with views around 300 degrees of the compass. Check-in and -out were smooth and easy. Parking below the apartment building, with an elevator. Furniture comfy, good kitchen and laundry facilities and a great bathtub. Menton is a quieter spot along the French-Italian Riviera, just minutes by train or car from Monaco, Nice and Antibe in one direction, and Italy in the other. You could walk to Italy. We did walk to Roquebrune-Cap Martin. It is a higher priced part of the Mediterranean, which makes Laurence's place an even greater bargain. In the last two months we have had vacation rentals in Barcelona, Malaga and Granada, and hotels all over ten countries. Without a doubt, this was the finest by far. Thank you for your positive comments, it's always gratifying to hear that our guests have enyoyed their stay and we look forward to welcoming you again in the future! Situation géographique pratique. Résidence sécurisée. Vaste garage . L'appartement correspondait à la description. The apartment is located on the heights of the old Menton on the northern edge of downtown. It is 10 minutes walk from the restaurants, the shopping street (pedestrian) and the sea. The nearest beaches are the Beach Sablettes (Garavan Bay overlooking Italy) and the Beach Market (Sun Bay). We can do without a car, however the apartment is rented with parking on the first basement with elevator access. The apartment has an exceptional view of the sea with a terrace where you can take meals. Une caution de 350 euros sera demandée 3 semaines avant l'arrivée A réception des arrhes, un contrat de location sera adressé par courrier à l'intéréssé.